Marsh’s library is located behind Saint Patrick’s Cathedral. It’s Ireland’s oldest public library. Inside, the library is, for the most part, untouched, remaining beautiful. 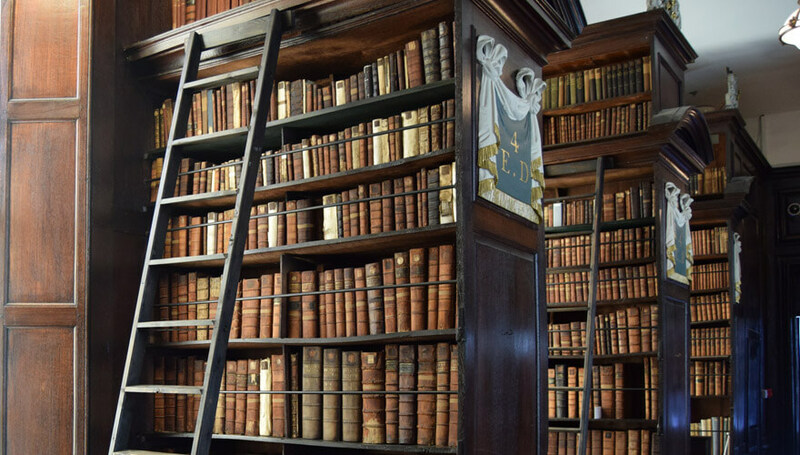 Marsh’s Library is one of the very few 18th century buildings left in Dublin that is still being used for its original purpose. It’s made up of two long galleries, joined by a small reading room. Books are shelved in bays on either side of the gallery. The interior of the library has elegant dark oak bookcases filled with old books. Bookcases are complete with rolling ladders and walking through the gallery almost feels like a journey through Harry Potter’s Hogwarts. But this library has more than just books as residents. The ghost of an old man has been seen rummaging through the bookcases at midnight. It’s said to be the ghost of Archbishop Narcissus Marsh, the library’s founder. Marsh was Archbishop of Dublin from 1694. In 1707 he founded his library, on the grounds of The House of St Sepulchre (the Archbishop’s house). It is not surprising that Narcissus Marsh should return to a place that has such importance to his life – even after his death. The story of the Archbishop’s ghostly appearance involves his favourite niece, Grace, whom he had reared from a child. Grace was nineteen years old and fell in love with a sea captain. Marsh did not approve and made his opposition to the relationship known. Grace and the sea captain ran away and eloped. she left a note for her uncle, explaining her disappearance and asking for forgiveness. Not wanting the Archbishop to find it in time to stop her, she placed it in one of the thousands of books in the library. But Archbishop Marsh never found the note, and returns to the library frequently, on an endless search for it. Walking from the first gallery through to the second, you can feel the temperature drop. Let’s pretend the chill is due to the ghostly spirits and not the north facing wall! Chained libraries were common from the middle ages as a means of keeping expensive books safe. 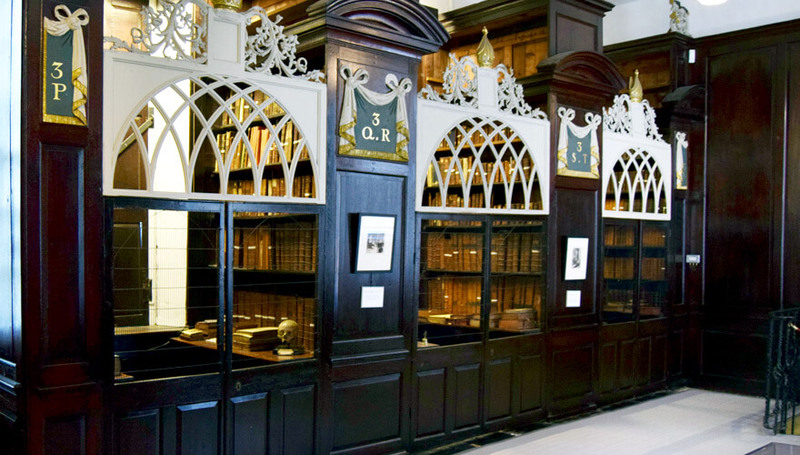 In Marsh’s Library, they locked the readers into cages – to stop them nicking the books! At the back of the library, you can see three of these cages, adding to the eerie feel. The bodies of Johnathan Swift (author of Gulliver’s Travels) and his girlfriend Stella are buried next door in St. Patrick’s Cathedral. Copies were made of their skulls and Stella’s can be found in one of the cages at the back of the library. Johnathan’s is next door in St. Patrick’s cathedral. Some people say that Swift’s ghost comes to Marsh’s library to visit Stella. Besides the ghostly visitors, Marsh’s has had a lot of famous visitors too. 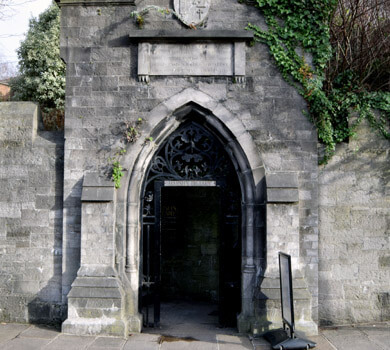 The likes of Bram Stoker, Jonathan Swift and James Joyce have all been here. You can see their signatures scrawled in the visitor book. Stoker became a regular reader in Marsh’s, visiting frequently during his studies at Trinity College. Detailed records happen to survive of what he consulted on his visits, books on religion, witchcraft and travel in Eastern Europe. Inside Marsh’s, you can pick up a booklet, illustrated by local artist, John Rooney. The book is an alternative guide of the library with ghost stories and some entertaining facts. For instance, some of the book in the collection were apparently preserved with urine! Although, some of these facts are perhaps exaggerated for children’s entertainment, it’s more fun to believe them. The people, places and things that make Dublin special. Set on 260 acres of parkland in the seaside town of Malahide, 16 km north of Dublin, Malahide Castle was home to the Talbot family from 1185 to 1975. The atmospheric castle – yes, there are ghosts – is furnished with period furniture and a large collection of Irish portraiture on loan from the National Gallery. Four main rooms are open to the public: the wood-panelled Oak room, the Small and Great Drawing Rooms and the Great Hall, where an exhibition records the history of the family who lived at the castle for almost 800 years. Montpelier Hill, better known as The Hell Fire Club to Dubliners, is a lovely place for a weekend walk. It has a variety of short forest trails and provides wonderful views of the city from the south-west. On the weekends you can find it busy with urbanites escaping the city and dogs running free. At the top sits a large hunting lodge where, if the stories are to be believed, some very strange things have happened. Originally there was a passage grave with a cairn at the top of the hill. Speaker Conolly, one of the wealthiest men in Ireland, built the hunting lodge on its site. Conolly is said to have destroyed the cairn while building the lodge, using a standing stone as the lintel of the fireplace.